When I bought Darcey Steinke’s novel Jesus Saves at a warehouse sale, I hoped that her words would speak directly to me, and they did. It’s a rare thing to find that sense of total communion with another writer. 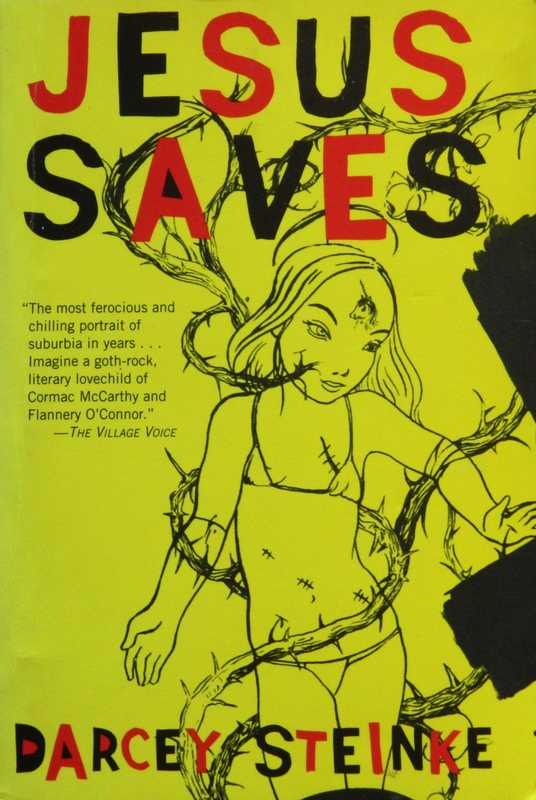 Set in a suburban malaise, Jesus Saves is about two girls. Sandy Patrick, who has been kidnapped, and Ginger, who suffers disillusionment at the crossroads between her struggling pastor father and a boyfriend intent on obliterating his own life. Sandy Patrick escapes her brutal conditions into an imaginary world with a bear and a butterfly and a white unicorn that comes to try and save her. She protects her mind from trauma by staying far away in the land of make-believe, but in the meantime, her body is falling apart. For the characters who haven’t been kidnapped by the man referred to as the troll, there is a different sort of prison. Grown women who dress like children; department stores with rooms made up of facades; fast food; and mega-church pastors who tell feel-good stories about television, sports, and success. The shiny veneer of suburban life masks the constant sense that there is a troll lurking behind every little girl’s back. And in the avoidance, blood and gore pervade around make-believe land. Pretend becomes the only savior until the game is over. No one seems to know how to fight back. No one but Ginger, who refuses to buy into the trap – whether it’s in church or in fairytales or suburban facades. When I was nine years old, we moved from a suburb of Chicago to Woodinville, Washington. Compared to our 1960’s era ranch house in the Midwest – which was nestled between the train tracks and the highway – our brand new house in the Northwest seemed like a mansion. It’s two and a half stories high with four bathrooms, a twenty-foot foyer and a pond with lush forest in the back. The house was part of a new development where all of the homes looked rather similar with small variations on layout and finish. The community surrounded an older house tucked behind high hedges at the end of a dirt road just down from us. Attached to the corners of metal link fencing were surveillance cameras, which seemed completely bizarre in such a low-key neighborhood full of people going to jobs at Microsoft. I only remember going down that road once in all the time Mr. Anderson lived there. A seven-year old girl at the end of our street made an attempt and received a nasty letter to her parents. In it, he demanded that they never allow her to walk down that road again, or else. But he didn’t own the road, and there was another house across from his. Sometimes we heard shots ring out. The old couple across the street, who served us tea and displayed their knick knacks in glass cases, told us that one time Mr. Anderson’s bullet barely missed the head of an old guy eating breakfast in the nook of his kitchen. I pictured the nook as being exactly the same as ours, except maybe facing to the east instead of west. I saw the window shatter, and imagined the bullet lodged in the man’s wall – the shock on his face, the realization as he inspected the damage. There was talk of banning gunfire in the neighborhood. But I don’t remember if anything ever came of it. I didn’t like the world of people when I was young. I enjoyed sitting in the forest at the back of the pond, hidden by one hundred-year old stumps and nurse logs, stroking my Dutch rabbit while smoking rolled up bits of newspaper. Life seemed real in the forest, in a way that it never did in school or inside the sterile house where I was under pressure to do certain things and act a certain way. The forest was the only place where I was allowed to be myself, and simply be. The rabbit listened to my diatribes against humanity for hours. Sometimes she made snorting sounds like a pig. Even though she hated people just as much as I did – truly dangerous with her sharp buckteeth – she felt safe with her soft chin and tickly whiskers nestled between my chin and collarbone. One day I was walking along the deer trails alone, further out than I normally go. I saw Mr. Anderson in the distance with his rifle strapped across his shoulder. He was large and frightening and seemed more like a shadow than a person because I never saw his face. I sensed that he was coming right towards me. I turned and started to walk as fast as I could back to the clearing. His steps grew louder and faster as twigs broke beneath his boots. When I made it back, I turned to look, but he was nowhere to be seen – like the mirage he always was. He represented the wild danger of what this place once was – a last frontier. Our suburban houses were whitewash over pine trees, cougars, coyotes, old farmsteads, and the Native American tribes that I still felt in the ground and the remaining trees. The present and the past were so at odds with each other that Mr. Anderson finally moved away – hopefully into the mountains where his breed was the norm. We could all breathe easier after the troll left. They clear-cut the forest when I was seventeen. Men climbed the trees like monkeys, and chainsaws roared for hours. They left it raw and ripped to shreds. The only thing left was muddy tracks from the trucks that hauled the trees away. Wildlife destroyed, coves and crannies and a century of growth – since the last forest fire – gone. There was a strange law that said after a clear-cut, you had to wait seven years to build a new development. But seven years came and went, and no one ever built a thing. The government came to the rescue, purchased the land and made it a forest preserve with nature trails. So now you can walk muddy trails, gazing at nondescript saplings that all look the same for miles. It’s been about eighteen years, and I’ve enjoyed watching nature take the land back. If I was the bear, I’d head for the Cascade Mountains like Mr. Anderson should have. But the bear still hangs around and catches salmon in a nearby creek, and balances his enormous weight on the railings of back decks, stealing bird food. I went the opposite direction. I’m rarely ever in a place where the air feels wet and naked and the quiet hangs over you like a shroud. Somehow, I ended up right back next to a freeway in the city. My mother drove by and saw an ambulance in front of my building and called me when she got home. “Are you okay?” Her voice wavered and I could hear the urgency in her voice. She’d worried for the last twenty miles and forty-five minutes. I live in a mass of humanity, and in masses, people are dying all the time. If not dying, they’re falling, breaking bones, having a stroke, or threatening to commit suicide. One man in our building had a stroke, didn’t realize it, and was so out of sorts that he only ate ice cream for a week and lost a ridiculous amount of weight. I’m not afraid of death. I like to be reminded that life is short because it makes me work harder and love stronger. There’s only one shot to give life everything that I have, and playing it safe is just another way of being half-dead. I’m inspired by people that are fighters – the ones that never give up. Like my ninety-year old neighbor who still walks up steep hills even though her knees are bad and her bones are literally falling apart. The only reason why she’s still going is because she’s too stubborn to give up. I don’t think she gives trolls a second thought, and when you’re old, it seems, your value to trolls decreases. If I have a child, we might read books about magical bears and hookah smoking caterpillars and flying ponies. But I won’t shelter them from reality. I’ll teach them to be strong, fully present, and ready for any twist in circumstance. I won’t sugarcoat the facts or lead them to believe that life is easy. When I was young, I thought I could map my whole life out, but it doesn’t work like that. I’m glad that it doesn’t. Dodging trolls has made me stronger, and no matter where I go, the world is always like the forest. You have to stay alert, allow yourself to be fully tapped into your intuition, and listen for the sound of crunching leaves. In the midst of that, the world is also so beautiful that at times it’s too much to handle. A gift that could be snatched away at any moment. All we have to do in the meantime is be alive in the best way that we know how – work hard, love strong, give all. You are currently reading Suburban Malaise at Lauren J. Barnhart.